4 Apr : A decision has been taken to disallow further installation of statues and portraits in Parliament to maintain its neat and spacious look. A high-powered committee of Parliament headed by Lok Sabha Speaker Meira Kumar has recommended that no more statues could be installed in Parliament in future holding the view that it is already over-crowded with high profiled figures. However, there is a caveat. In rare cases, the permission for the same could be given but in such cases proposals would have to be sent to the Heritage Committee of Parliament and it could go further only after the committee’s nod. This committee also comes under the jurisdiction of the Speaker and is responsible for maintaining the heritage character of Parliament. Sources in the Speaker’s office said it was decided to involve the Heritage Committee in the whole process because it looks after the structure of Parliament. Finance Minister Pranab Mukherjee, senior BJP leader L K Advani and CPI(M) leader Sitaram Yechury were also present in the meeting, and they were of the opinion that Parliament House is over-crowded with statues, a source said. The committee decided in the meeting that only a symbolic unveiling of portraits would be allowed and after that the portrait would be handed over to Parliament library. It was a long pending demand from many quarters. Former Speaker P A Sangma had also supported the idea but due to some political constraints, could not proceed further, sources said. 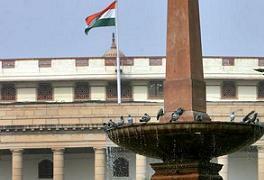 At present, there are more than 50 statues and portraits of national and regional leaders in Parliament. Former Speaker Somnath Chatterjee had announced a ban on installing new portraits in the Central Hall of Parliament in 2004 itself and started a new portrait gallery in the library building of Parliament for this purpose. Sources said the committee has, however, not taken any decision on the pending proposals of installing portraits/ statues including that of TDP founder N T Ramarao, which have already been approved by the General Purpose Committee.